At the Law Office of Berge Tumaian, LLC, in Moorestown, New Jersey, Berge has the experience dealing with the legal issues affecting you and your family. He assists you in all areas of matrimonial and family law, as well as Wills and Estate matters to ensure those closest to you are taken care of. 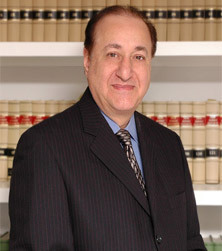 Berge is also an experienced litigator, having represented clients in Court on many cases of various types of matters. Your family’s legal issues are his top priority. Family is personal. Berge has always taken the needs of families very seriously. He has comforted many spouses during very trying times and mitigated many family matters in various venues within the State of New Jersey. Berge was trained by the Burlington County Court System as a mediator for Burlington County Municipal Courts, and serves as a Matrimonial Early Settlement Panelist in the Superior Court of New Jersey for Burlington County. Just when the emotional rollercoaster of life gets the best of you, Berge provides a steady course throughout the entire process. • Advanced education – Berge is highly experienced in mitigating legal anxieties in matrimonial and family law matters, or representing you in a real estate transaction, or defending you in traffic court. Berge’s Electrical Engineering and Masters of Business Administration background brings extensive analytic acumen to your case. • Recognition in legal circles – Berge was named the 2011 Professional Lawyer of the Year for Burlington County by the Burlington County Bar Association and the New Jersey Commission on Professionalism in the Law. • Professional Affiliations – Berge is a Master member in the Thomas S. Forkin American Inn of Court and served on its Executive Committee. He has chaired the Membership Committee from 2005 to 2010 and from 2012 to 2014. The focus of the Inn is on improving the skills, professionalism and ethics of the Bench (Court) and Bar (attorneys). Berge presently serves as the Co-Chair of the Family Part Bench/Bar Committee. He also has served as the 2014-2015 President of the Burlington County Bar Foundation. Berge presently serves as a Trustee on the Burlington County Bar Association and Foundation. Berge is a member of the New Jersey State Bar Association’s General Council from 2013 to the present. Call 856-722-1818 now or contact the Law Office of Berge Tumaian, LLC online for your free consultation.